Subtitled, “Why Financial Aid and Enrollment should be BFFs,” this session walks attendees through the Student FinAid Journey from pre-enrollment to graduation. 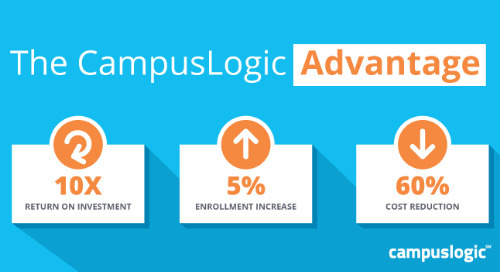 It shows all the points where financial aid processes might intersect with enrollment goals to create friction—and how the CampusLogic Student Financial Aid Engagement Platform smooths out those problematic twists and turns. During the live session, we asked attendees to list the two Financial Aid challenges that impact Enrollment the most. “Confused students and/or parents” (82%), followed by “Students not knowing where they are in the process” (70%) took the top spots. Both frustrations echo what students have been saying in surveys for years. Just search #FinancialAidFail on Twitter if you’d like to see for yourself. The Student FinAid Journey—in a cool map format! The CampusLogic platform allows for a unified, friction-free experience across the student journey. Ready to learn more? Here’s how the FinAid team at UT-Chattanooga went from “up to our ears in 399s” to a streamlined, efficient process that helps keep students in school.